The museum is more than a collection of things. It gives a broad view of the human race  our ways of life, our artistry and ingenuity. In displaying the beauty of art and nature, it ignites the imagination and restores the soul. It can stimulate thought and inspire new ideas. As children, our value systems are developed at an early age. I’m not talking about the value system that deems what is right and wrong, nor what is appropriate. The value system I refer to is the one which helps us choose the tangible items in our lives that hold our interest and are therefore deemed special. 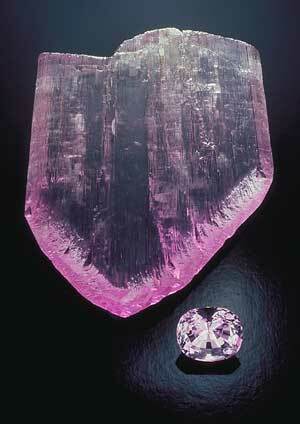 Rough and cut kunzite. This gem was named after famed collector, George F. Kunz. Because mineral specimens are one of Pala’s specialties, we (along with the support of Mother Nature’) have had a hand in building mineral collections in some of the world’s most prestigious museums. In this issue, we have chosen to re-introduce you to two of our industry’s earliest curators. 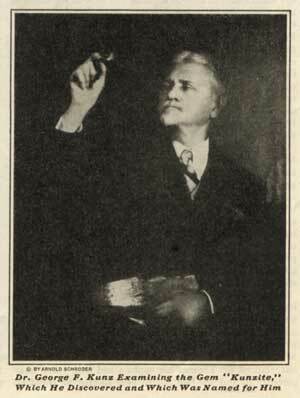 George F. Kunz and Albert Ramsay were two real-life Indiana Jones types. At a time when not much was known in the field of gemology or advanced mineralogy, they, as well as many others, showed the way in the fields of museum acquisitions, as well as private collecting. They were men who turned their love of collecting gems and minerals into professions that stepped outside traditional retail and manufacturing. Collectors are indeed a rare breed in their own right. From the very earliest of collectors up to the present day enthusiasts, I have found that a deep seeded passion for gems and minerals is the one trait that remains common in their lineage. Gem and mineral collecting is a constant re-education of one’s self. Without being consciously aware of it, you are continually familiarizing yourself with origin and rarity, as well as structure and aesthetics. Unfortunately because of the lack of any rational classification of minerals, printed reference materials from the earliest of times are not precise, and have made the origins of many specimens in the older collections difficult to determine with any degree of accuracy. We at Pala International take pleasure in furthering the education of collectors, as well as helping to ensure that mineral specimens are preserved against the ravages of time. Under the guidance of owner and avid mineral enthusiast, William Larson, we have enjoyed advising collectors of all ages. Hence this issue of the Gem Spectrum is designed to help stimulate an interest in gem and mineral collecting. no so-called fancy stones were on sale in any jewelry store in the country; one could scarcely find them in a lapidary’s shop, yet, reviewing those that I had gathered, it seemed to me that many ladies, even those who could afford the gesture of diamond tiara and pearl choker, would be happy to array themselves in the endless gorgeous colors of these unexploited gems. As I looked over a collection of them, with the sunlight imprisoned in the sea-green depths of the tourmaline, lapping at the facets of the watery-blue aquamarine, flooding the blood-red cup of the garnet, glancing from the ice-blue edges of the beryl, melting in the misty nebula of the moonstone, entangled in the fringes of the moss agate, brilliantly concentrated in the metallic zircon, forming a milky star in the heart of of the illusive star sapphire  how, I thought, could a woman ever resist their subtle appeal? So one day, buckled in youth, I wrapped a tourmaline in a bit of gem paper, swung on a horse car, and all the way to my destination rehearsed my arguments. Arrived there, I was finally received by [Charles Tiffany] the managing head of what was even then the largest jewelry establishment in the world, and showed him my drop of green light. I explained  a very little; the gem itself was its own best argument. 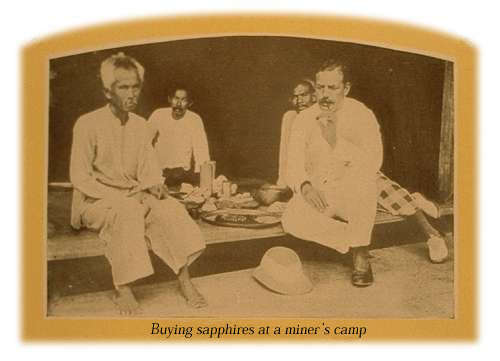 Tiffany bought it  the great dealers in precious stones bought their first tourmaline from me. The check which crinkled in my pocket as I walked home in the late afternoon, forgetting there were cars, stargazing, tripping over curbs, meant very little in comparison with the fact that I had interested a foremost jeweler of that time in my revolutionary theory and made the acquaintance of a man who was later to become my close friend. “And for those of conservative taste, these stones can be as handsomely mounted in present-day settings as the precious stones,” I added. He snapped his fingers, shook that mane of hair. In May, Pala International met with two Russian suppliers who had just come from the demantoid garnet mines and thus were able to question them on mining activity and the production outlook for the year 2000. Currently, the cold Russian winters are giving way to spring; however, the ground is still frozen and mining activity is yet to commence. Reports from the Bobrovka mine are not encouraging. This historic deposit has been worked again and again, and both our suppliers believe that production from here is minimal, at best. Mostly independent miners are re-working tailings or small alluvial areas which have been worked several times historically over the last 130 years. The finest stone that we have seen to date was a newly mined 5-ct. gem, but the color was a little towards olive. Its asking price in Russia was US$4,000/ct. they tend to cover up as much as they expose. Now many of the producing demantoid veins are buried under several feet of newly-dozed material, thus making direct mining of these veins more difficult, instead of easier. The lack of organized mining has been disastrous to the production, so that we have seen supplies dwindle, as demand has increased. There is still a good supply of under 1 ct. melee. However, top color is extremely rare (less than 10% of the overall production). Large stones (anything over 2 cts.) have been exceedingly rare also. Last year both suppliers estimated they saw two stones over 5 cts. that were of superb quality and perhaps only fifty stones over 2.5 cts. of all qualities. We recently sold a beautiful 9-ct. oval. However, it was an off color. This season’s production will be gathered and cut and we will see the results in late July or August, in time for the Hong Kong Show. The new find of Nigerian rubellite, coupled with the simultaneous discovery of spessartine garnet in the same country, has created quite a bit of excitement in the trade. While both deposits are producing excellent qualities, quantities of late are disconcerting. As with any new deposit, the old adage of the best comes first again seems to be fulfilled. The only difference here is that production of new material seems to have ended. We are no longer seeing the parcels of rough that once were so prevalent. This fact, coupled with the verbal reports from Nigeria, lead us to conclude that these deposits are about finished. The World Wide Web has revolutionized the way we interact with information and Pala International’s website, store.palagems.com, is set to help you take advantage of it. Since opening in Feb. 2000, Palagems.com has garnered rave reviews from both users and the jewelry trade-press alike. Jewelers particularly appreciate the online database, where a large percentage of Pala’s inventory can be accessed. It allows quick searches and is available 24/7. By applying for a trade password, jewelers can view our wholesale prices online (the general public is shown no prices). Another popular feature is the Learning Vault, where articles on a variety of educational topics are found. So if you have yet to visit Palagems.com, find time to do so. 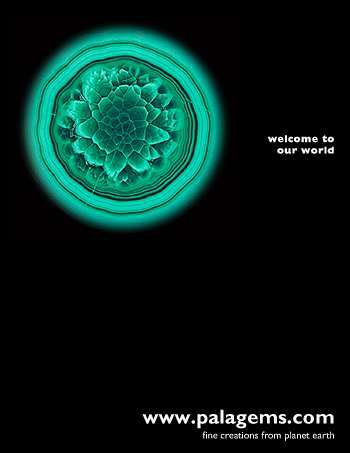 Our world of fine gems is waiting.